GDevelop is an open source software for developing HTML5 and native games without any serious knowledge in programming. Developing a game is as simple as setting up an event; gather your resources and start exploring. There are lot of tutorials available on the Wiki for a beginner (like me) to get started, and you can also find the documentation there also. This is my fourth translation report on the GDevelop project. Check out the previous reports: first, second and third. Working on this project is really helpful to me, as there are lots of things to learn, which wouldn't have been possible without this kind of opportunity. With the basic understanding of how to create scenes, events, animations and the likes using GDevelop, it would be less difficult to make use of other basic or advanced game engines though some might require additional programming or graphic skills. 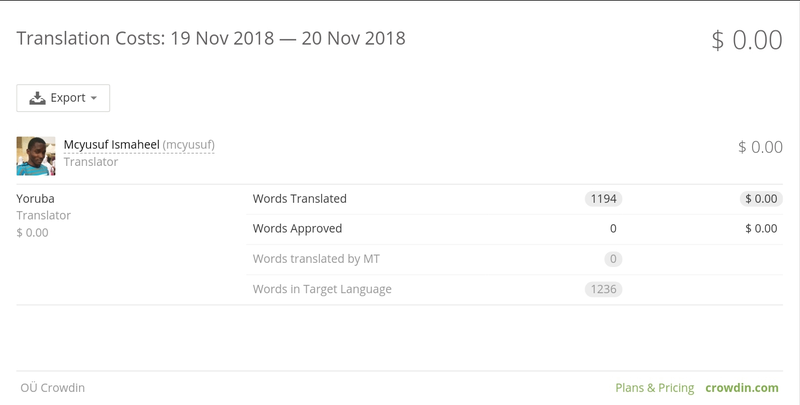 The project's translatable texts are a total of 25312 words and in this session I was able to translate 1194 words making an overall translated 5425 words (21% of the total). The project should be completed in 20 sessions approximately (~16 left). Some words left untranslated this session e.g. Parameter, NewChild, and so on are either technical terms or variables. Hello @mcyusuf, thanks for the contribution. Your translations are accurate. Presence of untranslated words such as Parameter and GDevelop result into reduction of the word count.